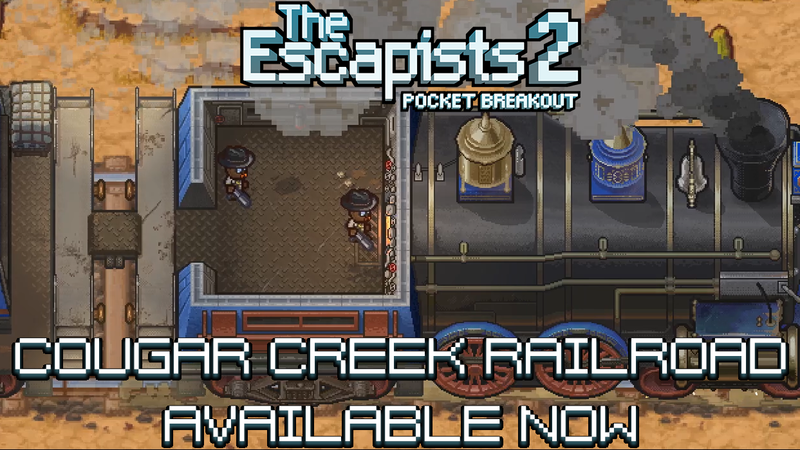 We’ve just updated The Escapists 2: Pocket Breakout on iOS and Android to now include the first of three transport prisons, Cougar Creek Railroad! Transport prisons are different from the normal prisons because they are timed. Your task is to escape the moving vehicle – which is a train in this case – before it arrives at its destination (and puts you back in normal prison). You don’t have to worry about routines, favours or other inmates. You just have to figure out how to escape. There are unique escapes to discover whether you’re playing alone or with friends; will you make your way to freedom? Whether you’re a new or existing player, all you’ve got to do to check out Cougar Creek Railroad, is to download the new – and FREE – update. As a reminder, we’re working to bring all existing The Escapists 2 content to The Escapists 2: Pocket Breakout, via continuous updates in 2019 and beyond. This means that we’re still going to add at least nine additional prisons to the seven already available. We hope you’re up to the challenge of escaping them all! Think you might need some help? Check out our Guide to Freedom which should help you get started. Fixed – Client will experience an infinite loading screen when attempting to join a session whilst the host is on a results screen or escape cutscene. Fixed – Versus timer is not functioning as intended and players are given no score on escape. Fixed – If the player opens a tutorial popup window while another window is already open, then closes both windows, some parts of the HUD will disappear. Fixed – If the player carries a coloured rock, through the mining job on The Glorious Regime prison, and does a save/load, the coloured rock loses visibility. Fixed – Touch Controls cannot tap on inmates to make them stop moving. Fixed – Sent invites do not expire. Fixed – On Google Play, if a player has no score posted and attempts to load my scores, no prompt is given and the tab will load infinitely. Fixed – Visual issues with UI elements on certain devices. Fixed – Tap to skip is seen during cut-scenes when using a 3rd party controller. Want to stay updated on anything The Escapists? Follow us on Facebook or Twitter, join the live chat on the Team17 Discord server, or sign up to the Team17 newsletter.